In the old days of Black Hat SEO, these techniques, tricks, tactics or however you’d like to call them may have worked, until the search engines started taking actions and updating algorithms to penalize websites using such Black Hat SEO Techniques. And, as the search engines don’t like to let themselves and their users be tricked, they took measures to keep the search results as clean and accurate as possible. Keyword stuffing is an old technique that had its moment of glory. It was highly popular before the 2000s, until Google started noticing that content with a great keyword density isn’t relevant to the user. For example, if you are the manager of a company that sells chips and somebody asks you if you have chocolate chips, I bet you don’t answer to them “We do have chocolate chips. Our best selling product are the chocolate chips because these chocolate chips have better taste than our simple chips and our customers love chocolate, so chocolate chips will be a better decision. Try chocolate chips.” You sound like a crazy person if you talk like that. I mean, who can actually talk like that? Ever? Repeatedly using a keyword in an article or a small piece of text – is like giving a definition of a word by using the same word over and over again. It’s not natural and healthy, nor unique. It’s bad user-experience and, worst of all, it will get you penalized by Panda Google Algorithm for low-quality content. It’s better to use expressions and write like you’d be talking to someone because the big G values more the content that is written for people than SERPs. But you already knew that, so why not put it into practice? What do you think about the next page? Does it look natural to you? I bet that you can find a range of online games on the site, but honestly, you don’t need to write it a thousand times to understand that. Well, that might happen if you stuff your site with keywords; you and your site will suffer alike. The story goes on with image alt descriptions that are over-optimized. A little trickier than keyword stuffing, this technique is found by search engine crawlers even though you burden your images with a lousy number of keywords instead of your text (content). Ever if you can’t see them, it doesn’t mean it’s not that harmful. Let’s make a thing clear: It is recommended to add images to your articles to make them more approachable. More importantly, you should write alt descriptions to your images, but don’t abuse it. If you read #1 and #2 you can see it is easy to get carried away from the right path – white hat technique. Using keyword-rich anchor for internal links is a clear sign of over-optimized website or overly SEOed, and it will look exactly like this unnatural smiley face. You need to keep your site neat and tidy. For example, you are writing an article on your blog about your beautiful trip to Barcelona and want to recommend a tour you sell on your site. Recommended: If you’d like to have an amazing trip to Barcelona, you should check out our amazing 6 day trip to Barcelona with a free travel insurance. Not recommended: If you’d like to visit Barcelona, we have a range of tours and activities; just check them all out at Barcelona For You. Google has come with a “solution” for those who are looking for the easy way to rank in the top; it’s called penalty. Some sites have qualitative content but don’t rank so well and some sites rank better, but have thin, over-optimized content. You might wonder which of the above cases is better. Te professionals think that means unique content written for the user and not for search engines and which has meaningful, relevant information. But don’t take our word for it, look at the examples below to see the rankings. In the screenshot below, you can find a site which provides a good user-experience. Now you see it’s not a myth anymore that using keyword-rich anchor texts for internal links to over-optimize your website can bring you a “pretty” penalization from Google. Another “joy” of the over-optimization game is taking abuse of irrelevant keywords just to rank. Just to make myself clear let’s say you like to play poker, but we know you are bluffing, just like your visitors will do when they enter your site, and they will run like bats out of hell. And your CTR will suffer. Gaining traffic by using lots of unnecessary keywords to rank won’t work. Cheating, like in every relation, is punished, and Google will take you/your site down. I get that you have plenty of topics in your niche, but stay there, don’t jump the garden to your neighbor. The dog will bite you! You might lose users that could have become clients, and they will buy from your competitors. That happened just because you weren’t honest with them. Sometimes your SEO specialist is so eager to get you on the first page of Google, he or she will neglect relevancy. If your SEO specialist gets you on the first page of Google for irrelevant keywords then you may not receive traffic. Relevancy is key. Webmasters find all kinds of scammy ways of ranking. This black hat SEO technique happens when you forcefully place internal links on the homepage for pages like “About us”, “Contact us”, “Products” and so on. It’s not only unpractical but also useless because those pages have a lot of traffic as they are, and it’s better to have deep links to strengthen your internal links. Hiding links and text for the sole purpose of building links comes in different sizes and shapes. Google has discovered all schemes: hiding text or links using CSS to position text off-screen, using the same color font as the background, setting font size to 0 or hiding a link to a single character. You would be surprised, but novices still use this ancient deceiving technique. Not all hidden text and links are bad for your site. For example, using a descriptive image alt description, a script for Java or code for Flash files is acceptable. The last two technologies will help improve the experience of your site with the search engines. Using multiple H1s on a page is a widely spread tactic to influence on-site SEO. Abusing this black hat technique makes your site look stuffed. Take for example the site below. It exploits the use of headings and keyword “plumber”. Never-the-less, I encourage you to write headlines, but take in mind that you should always have only one H1, and H2, H3, etc. just when it’s necessary. Copied content is a type of content that appears on more than one site. Also, it might be content stolen from other places (URLs). It is only giving a hard time to search engines to choose from all the duplicate content, and show the correct piece of information – which usually happens, and Google is showing the original content in SERPs. That because it can’t show duplicate content – it’s not relevant to the user. Oh, the good old days of SEO when copied content wouldn’t damage your site so bad! Nowadays, using this technique will hamper your ranking in a blink of an eye. Besides that, you might put your site at high risk of getting penalized by Google Panda. A safe way that is not considered duplicate content is using citation for the information you gather from external sources. Before you submit your content online and make it public you should check it to see if it’s plagiarism free. Content automation means using tools or scripts to generate content automatically and publish it on your site without any effort from your side. The automated content is written with no intent for the user, and doesn’t have any format or style whatsoever, without pictures, HTML headings, paragraph spacing, alignment and so on. Maybe you would think it’s a good idea in the short term because you’ll have a site with a lot of content in no time and effort, but you start to experience significant rank loss, keyword stuffing and worst of all risk of getting blacklisted from the search engine. There are plenty of tools to do the dirty work for you. But you’d better think of what the consequences will be before you act. I can tell you a safe way of getting ideas to generate quality content. You can try BrandMentions to inspire you to write and generate organic traffic and rank. It is useful and fun to find and search for information or keywords and see what’s trending. Bait and switch is a false way of changing your content just to a get a page to rank. The first step is to write a page for Google with a set of keywords, and after it ranks, the author changes it with another project or product. When users enter the site, they see something entirely different. This is indeed a crafty idea, and the person who came up with this technique was creative. This cheesy way of tricking Google might have worked well in the past but now it will get you banned and if you “hit the jackpot” you could be subject to a lawsuit. In 2011, Groupon used ‘’Bait and Switch’ in Search Ads and was accused of running “false and misleading business and advertising acts” by a bus tour company in San Francisco. The keyword they used was “incline village snow play area”. Bitcoinspot.nl took action and ranked for the keyword “download games”, but the site is about Bitcoin. It is the act of crafting a (manual or automated) way of rewriting content just to escape the ”duplicate content” – umbrella and to generate “new” content to look good in front of the search engines. It’s considered black hat because you don’t bring any value and relevant information for the user. If you discovered something new about a topic you already covered in an article, you could just write the new piece of information as an update. This way you can help that article rank better and give it a boost. Scraping content is stealing content from other publishers with a little help from scripts and post it on your website. It is an interesting practice because it was the subject of some cases regarding breaching copyright of the original site owner. Hatching scraped content is not only forbidden but also illegal in the United States and other countries. For example, in 2011 in Canada there was a cased called Century 21 Canada Limited Partnership v. Rogers Communications Inc., 2011 BCSC 1196 which stated that “The prohibited uses expressly include but are not limited to “screen scraping”, “database scraping” and any other activity intended to collect, store, re-organize, summarize or manipulate any Content (whether via an automatic program or a manual process).” It is against Google Guidelines, also. Over the time, thereappeared that sidebar with “latest news” implemented by webmasters, but some of them got carried away and published too much information. You should be careful with how much information you post on other sites so that you won’t upset the big G.
This goes both ways. If you are a victim of this act, you can find software to help you discover who is stealing content from you and complaint against the site that has stolen your content. I’m not giving you ideas, just helping you make a difference between what’s wrong and what’s right and get away from the temptations and the bad guys. And I’m not talking about Google, he’s the good guy. Well, he is good as long as you’ve done nothing to upset him. It is a dishonest way of using two pieces of content. One is written for the search engines to rank and Googlebot to crawl and the second one for the users. Using cloaking violates Google Guidelines, and you risk getting penalized by Google Penguin. That is because cloaking is believed to be used to fool search engine’s algorithm. On the other side, if you are a user, the best way to avoid being a victim of such software is to install an antivirus and update it regularly, avoid downloading files from unknown websites, keep away from shady sites or to click on ads that look too good to be truth. Clickbait is an eye catching and deceptive headline written with the sole purpose of making you click on it. It says one thing in the headline and another thing on the site. It uses expressions to entice you such as “You won’t believe …” , “Important news about …”, “Shocking!! You need to see this…” and so on and so forth. This deceiving technique will decrease your CTR, and on the long run, it’s bad for your site. Usually, those who use clickbait want to generate income based on the number of clicks. You can see this excessive technique in tabloids, where it is widely spread. An excellent example of clickbait is offered for “free” by Xpango, which says that it can give you a free Apple iPad and even promises in the description that it’s “not catch and it’s free”. Though, when we enter the site we see that we need “just 25 credits”. No catch you say?! Facebook wants to stop clickbait. The aim is to de-prioritize posts with headlines that hold information and entice you to click just to find out. Multiple sites that are connected between them in a circular network to rank and get traffic from related websites create a webring. Sage Well was the one who came with a script to develop such concept in 1994, when it began to become popular before Google times. To be a part of a webring, you must receive approval from the webmaster. Even doing bad things became harder and harder. There are plenty of people out there that use this technique to get backlinks. Don’t be one of them. They usually send messages to bloggers to publish an irrelevant article with a link and most of the times it’s a dofollow link. Those who send requests for guest blogging on a site can hurt its ranking if the site they link to has bad user experience. If it doesn’t say the name of the site how could I possible now if it’s relevant? This is kind of obscure. By any chance, if you are one of the bad guys you will pay your debt sooner than you think. Not only will it affect you, the guest blogger, but it will also affect the site that accepted it. In 2014, DocSheldon.com received a manual side-wide penalty for having an outbound link pointing to an unrelated site from a guest post. Matt Cutts, the former head of the webspam team at Google touched a sensible part in the next tweet in 2014. You need to offer information that will help the audience and send it back to your site to generate traffic, not irrelevant links that will get you down for good. As the song says, a link farm is a collection of websites connected with each other, manipulating your link profile by increasing the number of inbound links. It has a negative impact since Google sees link farming as a spammy way of getting links. The content of a site that participates in a link farm looks just like every other site on the internet with an exception: it has text covered with irrelevant hyperlinks linking to random sites. The use of link farms was popular in the days when Google Page Rank mattered, but as time changed, Google also changed, and now this practice will get you penalized because the generated links are considered to be unnatural. Humans do not create the exchanged links for humans, but rather for search engines. This strategy happens when you “revitalize” your content into a commercial one. The trick is to gain links for a particular article and then change it entirely with a commercial one having no connection whatsoever with the first topic. Even though the content you ranked for was unique and qualitative and the links were natural if you changed it to something else it shows you’ve frivolously looking to gain traffic. Since Google has found many ways of getting rid of those who manipulate the right way of reaching the top of SERP, people get way more creative and not in a good way, but by trying new methods of cheating. And that is how the practice of sending free products in exchange for reviews with links appeared. Don’t get me wrong; it’s ok to ask your clients for a review, but not with links. Using this technique in an excessive way could get you down, rather than up in the search results. And don’t get me started about the fake reviews that appear on your site with the sole purpose of gaining trust, which brings exactly the opposite if you get caught, which happens most of the times. An example in this area is TripAdvisor. An Italian newspaper created an account for a fake restaurant in Italy to see if TripAdvisor’s review moderation and fraud detection team will discover it. The restaurant, named Scaletta got lots of fake reviews and started to look like a real place. After a month it was rated the best restaurant in town. The experiment ended when the newspaper sent a message to TripAdvisor explaining their intent and proved that TripAvisor’s reviewing system is defective. It refers to an agreement between 2 sites to rank in Google. I will spoil the moment so you won’t get tempted by this method because it’s considered a link scheme and it won’t let your site appear in SERP anymore. The good guys run with the speed of the light when they hear about this black hat SEO technique. At a quick search on the internet you’ll find lots of sites and directories that offer links in exchange. They even make big promises such as free links, quality links for your niche, no footprints and you can even make money through their affiliate program. It is easy to do link exchange and rank afterward, but you will get penalized just as easily. It occurs when you try to generate links by commenting on different blogs and sites to link back to your blog/site, despite the fact that the sites are relevant or not to your niche or activity profile. Usually, this kind of technique uses links that go to the homepage. Commenting just to get a large number of backlinks easily is considered a black hat technique. If you are a blogger that received this kind of spammy comments, you can do something to stop them. You can delete them as soon as you got them, but the adequate way to proceed is to mark the incoming comments as pending and waiting for approval just to avoid polluting your site with links that could get you penalized if they come from bad, toxic sites. 301 redirect is actually a good practice. You can use it to send a user from a URL to another one if the original page has moved or changed. Sadly, over the years, it began to be used as a bad SEO technique. Webmasters take advantage of expired domains to keep the link juice. They are redirecting the old site to their site. In this case, using 301 redirects is a shade of gray hat SEO. You could easily fall into the dark area of SEO if the expired domain is not relevant. Would it matter if I told you that you might get penalized by Google for this practice? It should! Another shady redirect is practiced on online movies sites. When you click play to see a movie it redirects you on all kind of sites, most of them being unrelated. 301 redirects, as a grey hat SEO, is used to generate traffic on sites not in a natural way. Commercial anchor text keywords are those money keywords used to generate financial value. If your site has fewer or not at all non-branded keywords, it will show that your Anchor text profile is not organic at all. You can use the Anchor Text Distribution & Classifier from cognitiveSEO tool to see the ratio between commercial vs. brand keywords and to classify them. We call them spammy, junky or scammy footer links because you write them with the sole purpose of ranking and cheating your way up to the top. The links are not written naturally, in an article, showing and explaining the connection between you and the site you’re linking to. Sadly, this is a practice used by many people and in the end it will lead to rank loss. You could end up with a penalization in the worst case scenario. Loading the footer of your website with links will only get you a large number of unnatural links and this can cause rank loss. If you’re selling links to pass domain authority, it will de-index your website and cut your traffic to half (if you’re lucky) because it’s against Google Guidelines. There isn’t so much to say about this ancient technique. Just be careful and don’t try this at home or … anywhere. Matt Cutts argues that if the site that sells links gets caught and it was linking to you, all the value you were receiving from that link goes away. Remember what we’ve talked about selling links? Well, buying links isn’t so far from that. Even though the site you are buying links from says they are qualitative, don’t get yourself fooled. It sounds too good to be true. Stop buying links to receive link juice. You will lose money and time for ranking. Not to mention that you will need to spend time again to correct the mistakes you’ve made. A significant change in Google occurred when it was discovered that people were paying for advertorials to pass PageRank and since PageRank was officially declared dead, it doesn’t mean that now paid advertorials are not against Google’s Guidelines. The former head of Google’s web spam team, Matt Cutts, tweeted about the connections between paid links and advertorials pages. When you use this technique, you have paid links. And paid links could also pass authority. The good thing for those who use this practice is that paid advertorials seem to be indexed in Google News. This loophole appeared in Google’s guidelines, and that gives the possibility to publishers to appear in that section. But this doesn’t mean that it won’t come a time when Google penalizes your site? You can see an example for this situation from Lean Cuisine that paid for an article in Mashable. If you want to do good things that will count in the future and want to pay for advertorials, then a good practice will be to set all links as no follow. You know that saying “What goes around comes around”. Well, that applies to this technique also, as for the rest. If you are registering and/or buying placements on low-quality directories, it is not good practice. A great importance is the value of that directory and if it proves to be a link scheme, well you know what happens, you’ve got the picture. A real question will be “Are there any good directories that I can register on?”. Yahoo has a directory that could fall into this category. They have a well-put set of rules; not everyone can register, and I think it is a good example. Before that, you should create an account for GoogleMyBusiness, Facebook, Twitter or Linkedin and then see what the best options are for profile and niche. Don’t do what everybody has been doing, be BOLD! The next question will be “Are paid directories held to the same standard as paid links?” and the answer comes from the one and only Matt Cutts. You need to understand that Google will always try to get smarter and offer valuable content for its users and directory listing is an option. At least, not anymore. It is an illegal way of gaining access to a site, creating a web page on it and inject it with lots of keywords and links pointing to the black hat SEO practitioner’s commercial page. They set up a parasite hosting to take advantage of the authoritative domains from Google. This way they would receive traffic for their site and money from those who want to buy. Usually, this happens without the knowledge or consent of the person who owns the authoritative domain. Before you get caught, and God knows what will happen to you and your site, you must wonder “Is the black hat SEO worth it?”. Just do good and good will come to you. It is a way of influencing the rank of a page by artificially increasing the number of linking to it and the anchor texts used for that. A black hat SEO practitioner will manipulate Google’s algorithm by “helping” one-page rank for an entirely different keyword. This happens because it is the same anchor text used for the pages that link to that page in particular. 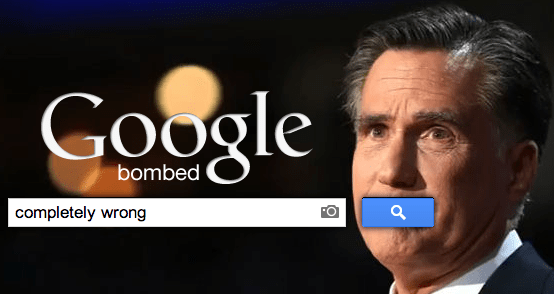 One of the most discussed examples of Google bombing was the query “completely wrong” for Mitt Romney. If you search images for “completely wrong”, Google will show you a picture with Mitt Romney. If you are a victim you must know how to defend yourself by these evil ways of hijacking your site. Doorway pages refer to the practice of inflating a site for a particular query in SERP using some cloaking and sending the user on a page that doesn’t have any connection with the query whatsoever. It is an adapted way of redirecting, a more crafty one. Those who use this technique want to rank higher in SERP in an unnatural way, of course. In March 2015, Google launched a new doorway page penalty algorithm especially for this type of technique. And when you go on the site you discover a doorway page. I didn’t find what I was looking for, but instead a list with top pharmacies online. Structured markup data can be a great way of formatting how your site appears in the search results when somebody looks for information. Also, it will help index your site. On the other hand, if you are creating irrelevant rich snippets markup you risk getting manually penalized by Google for this scammy technique. For example, if you use snippet markup for reviews and you don’t have a policy of reviewing on your site it’s counted as rich snippet markup spam. Sending automated Google queries means that you use a software to inflate the number of searches for a specific keyword to rank higher in SERP. If you aim at positioning your site higher in the search results in this unnatural way, Google has a way of disappointing you and penalizing you. A mirror site is used to reflect the original website content into a new one in order to increase its ranking. This could be another way of duplicating content from your site or other resources. The bad guys out there will try and convince you that they are using this technique just in case of DDoS (Distributed Denial of Service) attacks. DDoS is a cyber attack where multiple compromised systems are used to target a single system to access important (personal) information. Usually, PBNs are created using expired domains. This is because they already have link juice and that can come in handy when you are trying to pass authority to another site that doesn’t have so much. Yet, this is not mandatory. This hijacking method is based on a typographical error to create malicious domains to look similar to well-known brands. This error counts as common misspelling, unnoticed foreign spelling, an abuse of the Country Code Top-Level Domain. The reason for this “affiliating” practice is to profit from the trademark name and brand’s fame. Here you can see the official site of Cartier’s brand. The downside for this practice is that it will put your reputation and your brand at risk of facing cybercrime. If a site is created for the sole purpose of link building and it has one of the link issues named in the picture below then we might be talking about toxic sites. These link issues are just a few of the possible ones you can stumble upon in the big world of the internet and toxic sites. If you are having links on toxic sites, they can damage your business. Also, having bad links from toxic sites as a result of a black hat SEO practice should determine you to review those links. An easy way to do this is by checking them within the Unnatural Links Navigator in the cognitiveSEO tool. Directly from this tool you have the possibility to manage them and even disavow them if that’s the case. Cybersquatting means registering domains similar to a trademark or business for the sole purpose of getting financial benefits. It contains the word “squatting”, which means acknowledging a public place without permission. Fraudsters who practice this technique could receive lawsuits because they gain money. They are redirecting people who came on the fake domain to an expensive pay-per-click advertising site. Cookie stuffing is a way of using scripts, pop-ups, toolbars and images embedded in message boards for a publisher to receive money. How does he receive the money, you may ask? Let’s say, for example, a publisher sends a visitor to the Example.com site and he gets credit for every sale made. You must know that stuffing cookies is an illegal practice. As the name says it, negative SEO does the opposite of what you would expect and that is to cut traffic and decrease SEO visibility continuously. But who wants that? I would that say a lot of people since we talk about it. They don’t want to do it for their own site, but rather false reporting their competitors to get them penalized. Gary Illyes, a webmaster trends analyst at Google, tweeted on his account saying that Google hasn’t seen a real example of negative SEO? The sad part for those who actually get penalized for something they didn’t do is that they don’t know who “buried them alive” but they could get an idea. If you are using the tool from cognitiveseo you can search through the Unnatural Links Navigator to review your backlinks and see where they are they coming from. Also, a great indicator of rank loss can be spotted by visualizing SEO visibility’s graph. TrackBack was used only to facilitate the communication between blogs by sending pings. A ping is a message sent from a blogger to those who are connected to him. Using it moderately or only you have a new article is not considered spam. Though, when you improperly use the TrackBack feature to get visitors on your site and send them numerous pings, it’s counted as natural. Referrer spam is a sort of spamdexing which is manifested by polluting a site with fake statistical data. The spammer aims to improve the ranking of his site. It doesn’t harm the site except for increasing its statistical data regarding traffic, visitors and so on. The positive side is that you have the possibility to filter the referral spam. Social Network Spam is a relative new form of spamming. Since web 2.0 appeared, spammers have found new platforms where they could spread their links. When they are sending an enormous list of irrelevant links in the Social Network, that is when the red flag rises. Spam in Social Networks is known to appear as links in comments to different posts, unrelated to the site; as sharing malicious links in irrelevant groups/pages/people; private messages sent to all kinds of people/pages one time or several times. To sum everything up, we reiterate a quote from Matt Cutts, who says “The objective is not to ‘make your links appear natural’; the objective is that your links are natural”. You think you could get away if you try some of these black hat SEO techniques, but sooner or later you may lose rank or traffic, damage your reputation, get a penalty from Google, lose credibility and clients, or worst of them all, face a lawsuit. Be an SEO practitioner of evergreen content. Until next time, be good to Google and he’ll (probably) be good to your site. Not sure I really agree on the keyword rich internal links. If you look at Skyscanner.net, Expedia.com, Tripadivsor.com and Cheapflights.co.uk all those sites rank well and heavily use over-optimised internal linking. If overused it may trigger some red flags at Google. It can be applied in a smart way though. I love the long-form posts your team has been publishing this year. And especially the work you did with Mike King and iPullRank a few months ago. This article, in particular, was a fun trip down memory lane. I played around with article spinning 5-6 years ago. It was fun to test the accuracy of various spinners – but it also gave me a headache. Number 32 Doorway Pages or Gateway Pages is very interesting. Ha! I’ve seen many cases! Great check list btw. Very good article about avoiding black hat SEO techniques. My hat is off to you! OK so let’s say, just say, someone was trying to push down a URL that is bad for their reputation. Which of the above could be done to that URL to penalize it in the search results? Excellent post on bad SEO practices. I really like it as I m newbie in SEO field. Thanks a lot for posting unique information and made me more knowledgeable person. Keep on blogging!! If everything is black hat then what is white hat. I don’t see that any one who started blogging since 2014 is doing white hat.. I see many bloggers who themselves use black hat but when comes to give advice they behave like they never done any black hat. Or it may be some technique to fool new comers in blogging.. Please tell how to rank and over take in Googles first page.. please post an article avoiding all these technique . I will follow.. just because cognitive SEO is a huge website and it does not require any of these you are giving advice ,then please say how to be a website like cognitiveSEO step by step..
Hey, thanks for the info on Black Hat SEO tactics. Being new to the SEO world, I’m starting to see why it’s such a competitive landscape. I, not only need to compete with quality content out there, but also unscrupulous bloggers that just want to get traffic quick. The video that you have posted under section 27 (paid links) lays out some good distinctions. Food for thought. Sometimes we make the mistake of presuming that every paid exchange is somehow a nefarious one, and that is just not the case. If it was then every advertising dollar spent would also fall under the same “deal with the devil” umbrella… including those paid ads on Google. Thanks for the article… lots of great stuff on here! My site’s Analytics started showing constant spam referral. EVERY single day!! Is there a way of notifying Google about that??? If Google is so good at punishing who uses black hat strategies, how come it doesn’t act against these companies?? Do you have articles about how to block these companies??? One of the most well writing article i’ve read in along time!! congrats to you! !